These ghoulish tea light candles are meant to be seen, so use them where the candle will be visible. This two dozen set includes 12 - Purple / Black Cat Tea lights and 12 - Green / Black Bat Tea light candles. 100% Handpoured quality candles, with average burn time 4 hours. 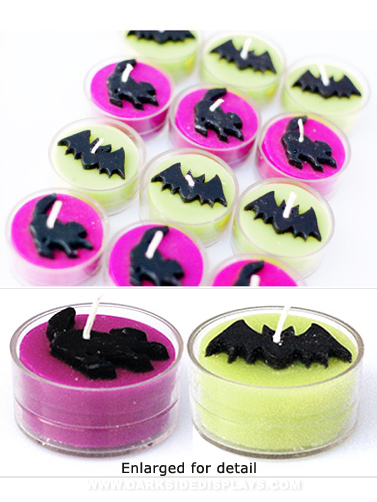 Cat & Bat Halloween Tealight Candles measure 1.5". 24 ct.